Any bread made with a starter is perfect for me. This sourdough whole wheat seed bread takes time and effort. But it is so worth it. Artisinal bread is a labour of love. You have to have patience, but the reward is great! I make use of a sourdough starter which provides bacterial (in the good sense) action on the starch and proteins in my bread dough. At the Taste Glacier event I attended, we were given a recipe for whole wheat seed bread, which called for a poolish. A poolish is a pre-fermented starter. This pre-ferment allows more time for the yeast and enzymes to take action on the starch and proteins in the dough. The use of a pre-ferment means your bread will keep longer and it adds more flavour to your bread. As I already have a sourdough starter I decided to rather use that instead of making the poolish. I cannot tell you if this made a difference to the bread, but I can tell you that it tasted good, which to me is all that matters. Have you ever made a poolish before? Disclosure: I was invited to Taste Glacier event and I was not asked to write a blog post about my experiences. This post is in line with my blogging policy. I love fresh bread and it truly is a labor of love. There’s nothing like a slice that is still warm with some good butter. Your loaf looks really great! I always enjoy seeded breads. I bet this one is great! 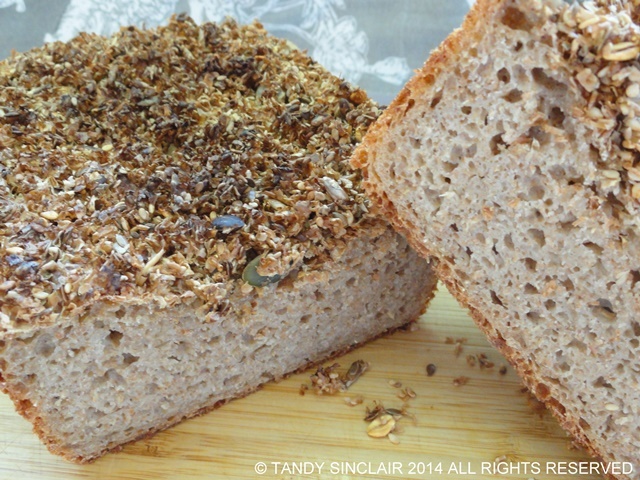 This bread sounds and looks delicious Tandy…I love the idea of sourdough and the seeds in it. Great looking bread and with your own starter is always the best. I love making bread but it is the humidity and fighting with my oven that cannot hold its temperature that pose a problem. ahh the joys of living in Hong Kong. At least I can look at your delicious bread. That crunchy seed mix on top sounds like an awesome topping!! I love making bread at home. The whole house just smells wonderful. I agree taking the time to use a poolish starter makes a huge difference in the bread you make. I love the flavor and aroma that this type of bread gives. Hi Tandy, always wanted to make a bread using a starter. Love all the different kinds of seeds in this. In your instructions when you say put ice blocks in oven, is that for moisture? I’ve never even heard of poolish before, Tandy, but it sounds fantastic. 🙂 So grainy and hearty and delicious. Looking forward to more sourdough baking when I’m back in England soon so will bookmark this one! I love seed breads so I know I would enjoy yours. It makes such good toast spread with some soft butter. Similar but not quite the same! Fabulous looking loaf of bread Tandy. Think I would skip the aniseed though. The aniseed scents everything it comes into contact with!